SPECIFY COLOR before adding to cart. Use UPS FREIGHT LTL or FREIGHTQUOTE during checkout. Special Order, leadtime 2-4 days. Non returnable. MATERIALS/COMPATABILITY: Clad with ASTM grade TPO (or optional PVC). Guaranted to be welding compatable with ALL TPO types. 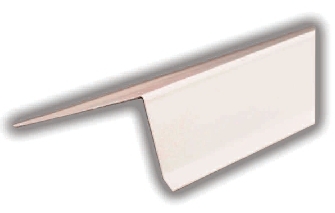 TPO Clad drip edge enables welding TPO at edge. Provides faster, easier, professional quality edge finishing in the field. SIZES: 2x2, 2x4, 4x4, Custom.